Well we have reached the weekend and time for my annoying bug of the week. I’m sure most forms consultants out there have already run into this one by now. There have been many solutions floating around (copying dll, installing patches, upgrading the jdk) But I thought I’d write a post with a pretty simple solution and with all possible keywords that people will use to search the error since my customers had trouble finding the solution on google. How would you search for this type of error? 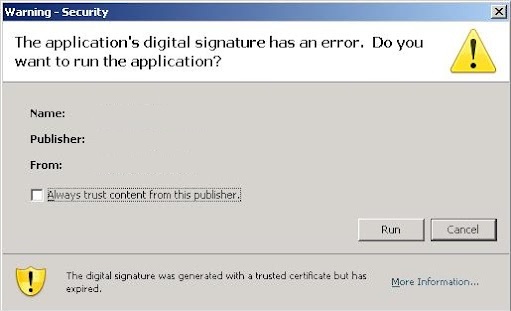 Warning – Security (Window Title) – The Applications’ digital signature cannot be verified (or has an error) . Do you want to run the Application? Check Box (Always trust content from this publisher) And there is a Run and Cancel button. The only problem is you can not click on the check box and the run and cancel buttons do not work. Your only solution is to close the browser and restart forms only to get the same error. You can move the window and even see the Java Console window but you cannot click anything. Basically you are frozen and cannot get into the Application. But after much wasted time you send an email to your friendly neighbourhood consultant who tells you a fix in a second which you are both thankful for but also drives you nuts that you wasted so much time looking for a solution. Sound familiar? Go into the control panel and right click on the java icon. Then make sure ALL browser windows have been closed. You should also check in the control pannel that no extra iexplore.exe processes are open and kill the program or “ORACLE FUSION FORMS … ” if it exists. Then when you run the forms again your browser will reload this page and popup the warning message again, this time you should be able to select the checkbox and accept the security warning. Once accepted the warning should not return. Anyone else run into this one? Hi, great talks at Solihull! (Matthias, who started the thread is a guy in my company). At the end you find our solution. Glad you enjoyed the Forms Modernization Day. It was great meeting so many people who are committed to forms and so eager to learn. Thanks for the forum pointer. To be honest while in Soulihul Sunny Patel from Oracle Support gave me a tip about this. He said that this is also connected to the order in which the jar files are listed in the achive= parameter in the formsweb.cfg file. He suggested putting Jacob.jar as the first jar file listed to avoid the error. I haven’t tested it yet but would be happy to get feedback if it works. Would mean for me (before testing) ..
ant the verizon root certificate of the oracle jar file will never have a problem because of being root certificates, if they are trailing. I am not really firm on this topic .. May be my thoughts are wrong. I was told by Oracle Support that leading with your own jar files will stop the error message. Did you try it? Did it work without changing the browser parameters? Just 2 words: it works! Can anybody explain this. To a Java-Non-Aficionado. Having the the oracle jars (frmall or webutil) first freezes the app. Having a self-signed jar-file first, app starts without troubles. Works even with more then 2 issuers (tested with 3). Thanks for being our test bunny. Hi Mia, I provided Oracle support with this nasty issue. I signed our custom jar files and put them in front of the frmall.jar file in the formsweb.cdg file and the security warning started working. I also modify the formsweb.cfg file so our Forms 11gR2 is working with both JRE 6 and 7. I have this problem, tried the Oracle fix, PROBLEM STILL EXIST. Anybody got any other ideas on fixing this problem? Would appreciate it. I’ve already verified browser being enabled and re-downloaded Java lastest version. Did you look at the comments on this post? There are also several other ideas listed there. Changing the order in which the jar files are listed in the achive= parameter in the formsweb.cfg file. We suggested putting Jacob.jar as the first jar file listed to avoid the error. After two days searching on oracle pages without luck we found this site. Your suggestion with ordering the non-oracle-jars first works!!!!! Even in forms 11.1.2.2 and JRE 1.6.45 this bug is still alive! BTW – We have to go for CA-Certificates as security-warnings get more and more. This was identified long ago. There are already several notes written on the topic. It is a java bug. It’s perfect time to make a few plans for the future and it is time to be happy. I’ve learn this post and if I may just I desire to counsel you some interesting issues or advice. Maybe you could write subsequent articles regarding this article. I want to read more things about it! a perfect manner of writing? I have a presentation subsequent week, and I’m at the search for such info. surgery the best decision she ever made. Just consider that it takes about twenty minutes per day using your fingertips for the first month. first 2 weeks, as this is the most crucial time.